This feature story is about a member of my Facebook group, Cross Stitch Club. Her name is Mel Farnsley and of course, she loves to cross stitch. I had the pleasure of meeting this wonderful woman at the 2015 Cross Stitch Club retreat I hosted in Hershey, PA.
Just in case you are not aware yet and are interested, I am hosting the next retreat this coming September in Harrisburg, PA and you can find more information on that by joining the Facebook group 2018 Cross Stitch Club Retreat. I also have started to plan for our 2019 Cross Stitch Club Retreat to be held in Nashville, TN in August 2019. You can join the 2019 Cross Stitch Club Retreat on Facebook to keep up on details for that one as well. Ok, now back to Mel Farnsley. Occasionally I run prize promotions in my Facebook group, Cross Stitch Club. For one of these such promotions, the prize was a custom handmade tote bag made by me. Mel was the winner of that prize. After she picked out the material she wanted me to make it with, I asked her if she wanted to add any pictures to it to make it a “brag bag“. She loved that idea and sent me 2 pictures. The nature of the pictures caused me to ask about them and the story behind the pictures was one I thought was worth sharing. Further down in the story you will see the bag I made for her and why it meant so much to her. I asked some questions of Mel so I am going to do this story interview style. Q: Where are you from and what do you do for a living? Mel: I live in Cincinnati, Ohio with my husband Fred and my 2 greyhounds. I am a retired hairdresser and owned my own salon for many years. I work for a property management company and spend my work days in the main office, assisting residents and potential residents. When I am not working, my time is dedicated to taking care of other family members. My mother, who lives with Fred and I, has had a number of serious health issues, including cancer and a brain bleed. My father-in-law, who has Parkinson’s and is in a nursing home near us. And last but not least, one of our greyhounds, who was just recently diagnosed with GI Lymphoma. Q: How did you and your husband Fred meet? Mel: Fred and I met online long before online dating was cool. We have been married almost 16 years. We took our family to Las Vegas and got married in a very traditional ceremony. While we were there, we joked about returning to renew our vows every five years and doing a different Vegas wedding each time. We stopped joking and have in fact renewed our vows in an Elvis wedding, an “Opposite/non-traditional” wedding (my dress was black and our chapel had been sold so we had to chose a new one), and a rooftop gazebo wedding so far. The drive-thru may be next, maybe. Mel: We do have 2 grown boys and our “bonus” daughter. We also have 2 Greyhounds that are our “children”. Fred and I adopted our first greyhound, Penny (Shiny Penny was her racing name) shortly after we got married. She was the rare grey that preferred to not have another grey in the family. She enjoyed being the center of attention and we enjoyed making her so. We learned so much about being greyhound parents. We were quick to get involved with the adoption group and helping them place other greys with forever families. When Penny passed away, it took us several years to be able to open our home and hearts to another dog. But eventually, we started checking out the local greyhound adoption agency’s website (Greyhound Adoption of Greater Cincinnati) and flirting with the idea of adopting a new pupper. We attended the group’s spring picnic and fell in love with not one, but two dogs. We each bought (paid the adoption fee) a dog for each other as our anniversary gifts. William (Free Willie) and Lena (Oh Lorena) stole our hearts that day. They both love going for long walks, which is great for us, and we walk about 2-3 miles every day. Greyhounds are sprinters so long walks aren’t usually their thing, but our babies fell in love with the walking and they have been wonderful walking companions for us. They enjoy greeting everyone on their walks. People like to pet them and ask questions about greyhounds. William and Lena have been excellent ambassadors for their breed and they are happy to do it. Sadly, our William was recently diagnosed with GI Lymphoma and will not be with us much longer. Needless to say, we are all heartbroken. Lena knew he was sick before anyone and she has been right by his side, doing what she can to comfort him. When he is gone, she will be as lost as the rest of us. This year I will be choosing a race to run in William’s honor and to bring awareness to the joy of adopting greyhounds. Q: How long have you been cross stitching and how did you get started in it? Mel: I started cross stitching when I was very young. It seems as though I was always a cross stitcher. I don’t recall first learning but I assume I received a small kit and fell in love with the craft. I don’t know if this was my first project, but it is the oldest one I still have. There have been periods of time when I haven’t done much stitching, but I’ve always had at least one project in the works. My taste has changed over the decades and I have watched the craft evolve. At one point, it became less popular, and then gained new popularity again as our world has become more connected through the internet and online groups. Q: Who is your favorite designer (s)? Mel: I tend to like a wide variety of designs, which means I like lots of different designers. Some of my favorites include: Alessandra Adelaide, Frosted Pumpkin Stitchery, Lizzie Kate, Sue Hillis, Ursula Michael, and White Willow Stitching. Q: Do you do cross stitch for mainly yourself or do you also do them as gifts? Do you do them more as gifts or more for yourself? Mel: My husband would tell you that I stitch only for him and that he lets other people borrow his projects. Actually, I stitch a lot for my family and have done many pieces that hang in our home. I hear stories of stitchers giving a piece as a gift and the recipient not appreciating the gift. Q: About how long have you been a member of Cross stitch club and what is your favorite thing about this group? Mel: I have been a member since the beginning. I love being able to see all the beautiful pieces that other members post. Even if it isn’t a piece I would stitch, I can admire the craftsmanship and creativity of each one. I love sharing in the excitement that we all feel when we finish a cross stitch project. Here is the name tag I created for the 2015 Hershey Retreat. Prior to finding a couple cross stitch groups on FB, I didn’t really know anyone else who stitched. I have learned so many things from the group that I would not have had the opportunity to learn otherwise. I stitched “Tribal Betta” for my bonus daughter on fabric that I hand dyed using the shaving cream method that I learned from other group members. I ended up buying fabric by the bolt because I got hooked on hand dyed fabric. I wouldn’t have even known of such a thing without this wonderful group. Oftentimes, I do like to change the patterns to make them more personal, add embellishments, use hand dyed fabric or hand dyed threads or simply create my own small patterns. Q: How big is the biggest cross stitch you have ever done? Mel: I have a couple projects that stick out as being big. However, I think of ‘big’ in terms of how challenging the project was to complete. Sometimes a ‘small’ project can turn into a ‘big’ piece of work. I made “From Grandma’s Button Box” for my mother many years ago and used buttons from her stash. “Up on the Housetop” is one I stitched for myself and proudly hang it each Christmas season. Q: What are some of your other hobbies and/or passions? Mel: I collect and stitch all things giraffe. This piece was originally a screensaver that I converted to a pattern and added the little giraffe. My girl, Lena, kind of looks like a short-necked giraffe. ???? My boy Willie, however, is cow print. See, I’m not totally giraffe crazy. At the beginning of this story, I mentioned about the “brag bag” I made for Mel as the winner of a prize promotion I did in Cross Stitch Club. You can see pictures of other custom “brag bags” I have made here. You will see my brag bag I made of my 2 military sons. I have gotten many comments on it and gives me an opportunity to talk to others about what it means to have our military fighting for our freedom! I also make many other items such as Q Snap, hoop and scroll rod covers, scissor fobs, needleminders and project bags. I am working on trying to get my store set up to be able to order directly from my site. However, that is proving to be a bit of a challenge at the moment. I customize everything and let you choose your own fabric and make it based on your request, not already pre-made. Until I have my store up and running, the easiest way to order anything is to go to my Fae’s Crafty Creations tab. There you can see all the products I have to offer. You pick out your fabric from my Fabric Gallery. Then you can either send me a message on my Facebook or join my Fae’s Crafty Creations Facebook group and let me know there what you would like. I can take all forms of payment such as PayPal, credit or debit card, and money orders. A certain percentage of all proceeds that I make go towards helping homeless veterans. Here are pictures of the bag I made her. She sent me these pictures after she received it to show me how she is putting it to good use. This gift came to her at a difficult time when she really needed some cheer and made it all that much more special. Mel asked me if I could personalize it somehow with my name, so I did on the inside underneath the pocket. It says “Made with Love by Fae Kuhn”. You can also see how roomy they are from this picture. Mel is definitely passionate about her running and this bag is more than a “brag bag”. It is more about the significance of her purpose, her mission, and goals. I am sure she will get many comments on this and it will allow her to talk about her passion and inspire others with that passion. Q: How did you get into running marathons? Mel: In January 2015, I was diagnosed as being pre-diabetic, had high blood pressure and was spread too thin with tons of stress. I freaked out and decided it was time to make the necessary changes. I bought a FitBit and tracked my food and steps and exercise. Fred and I mixed up our menu as we realized that even though he prepared most of our meals at home, we were eating more carbs and processed ingredients than we could have imagined. We started taking walks every day, adopted 2 greyhounds who love going for walks, and slowly I started running. On a whim, I talked a friend into running a 5k with me the following day and by end of that next day, I had won my age group in that race and was planning my next race. I had never been a runner – a ballet dancer, a cheerleader, but never a runner. I was one of those people who never understood why anyone would run ON PURPOSE, but with that one race, I completely understood! Through running and letting go of several sources of stress in my life, I was able to lose 80 pounds in a year and have kept it off with each mile. Within 3 months, I had the high blood pressure and pre-diabetes under control and have been able to maintain my health goals. Fred has been with me through everything and has also improved his health and lost weight. We readily admit that this journey is much easier as a team! Although he did not run with me for the first year, he was always there to make sure I made it to the start line in time and to take pictures as I crossed the finish line. He would listen patiently as I talked on and on about my training and race day strategies and mile by mile recaps of each race. Slowly, he began to run with me and now he runs nearly every race with me. He says that if he has to be there anyway, he may as well be running beside me. For Christmas, I got him an ornament to commemorate his first (running) half -marathon with the following quote: “Sky above you, Earth below you, Fire within you, Me always beside you”. That is how we make it through each day of this journey. Mel: I started running in the summer of 2015. I ran my first race in October of that year and it was love at first race. Q: How often do you run races? Mel: After that first race, I realized I was hooked and I decided that I wanted to run at least one race each month in 2016. Well, I more than met that goal and ended 2016 with 41 races covering 196 race miles. In 2017, I ran 54 races and covered 241 race miles. Q: How far have you traveled to do races? Mel: So far, the furthest I have traveled for a race is 2 hours. Last year, Fred and I ran the Happy Half Marathon a couple hours north of our home and we are looking forward to running it again this year. The medals we received from this race were handmade by a local glassmaker and one of our most unique. Q: What charities have you run for and how often do you run for charities? Mel: In 2016, I ran all of my races for me. 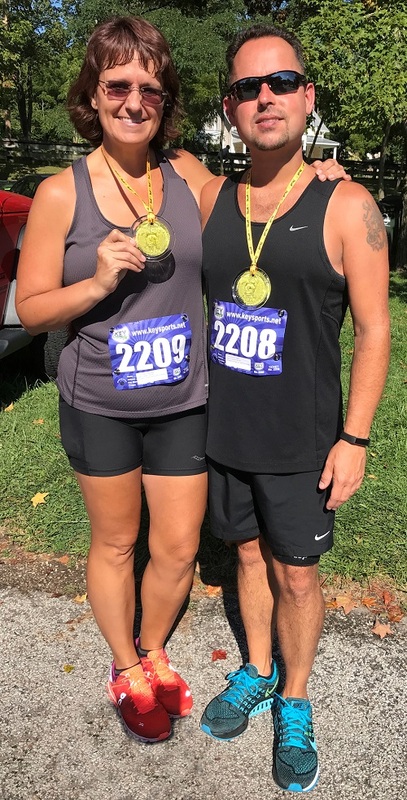 I was so surprised by my newly found love of running and how much it was helping me meet my weight loss and improved health goals. In 2017, I decided I wanted to run for others. Since my mother had battled cancer several times and I knew so many people who were affected by this horrible disease, I chose to run each race that year in honor of someone who had battled, was battling, or those left behind at the end of someone’s battle. I ran for my mom. I ran for my neighbor who battled a brain stem tumor and passed away before he was even old enough to drive. I ran for other runner’s parents and for classmates who were fighting the good fight and those whose fight was over. I ran for a young man who was in the final weeks of his fight and sent him the medal I won. Quinton’s battle ended shortly after I ran in his honor, so I ran again in his memory. There were races that were so emotional for me because of the person I was running for and the things they were going through, but I always knew it was worth the heartache. I always tried to have something meaningful to the person I was running in honor of. This was my way of opening a dialogue with other runners and spectators, giving me the opportunity to share the person’s story with others. When I ran for a fellow cross stitcher that I had met through a gift exchange in a FB group, I stitched this piece and then sent it to her. When I ran for my neighbor, Zac, I created this piece. It now hangs with my medals. Q: What is the longest race you ever ran? Mel: A marathon in 2016. I chose the hilliest, hardest, hottest, horrible-est, most amazing race for my marathon debut. Actually, I also managed to talk my husband into doing the half-marathon and my 75-year-old mother into battling the 5k. They both even placed in their age groups! I, however, barely survived. But, I survived! This is one of my favorite race photos because you can see Fred in the background. I called him at mile 19 and told him I didn’t think I could finish but that even if I have to crawl, I would cross that finish line. He actually walked (limped would be a more accurate description) back several miles after completing his half marathon to make sure I made it to the finish line without having to crawl. Yep, he’s a keeper. Mel is just one of the many amazing people I have come across in the world of cross stitching and other aspects of my life. These people inspire me in so many ways and I enjoy sharing their stories in hopes of inspiring and helping others. 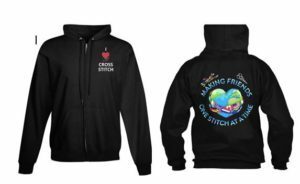 We all have our stories and are all amazing in one way or another and as time permits, I will continue to share stories of the amazing people within the world of cross stitching. If you have not yet read the story I wrote a few weeks back on Timothy Johnson, please make sure you do (you can just click on his name and it will take you to it). His story is just amazing and SO inspiring. I have also written features on 2 great cross stitch designers, Ursula Michael and Heather Maraldo. Please make sure you check them out if you have not done so already. In the near future, I plan to introduce you to some great fabric vendors (who have also agreed to run a special promo for you all that will be included in their stories…so get those wallets ready! LOL). Please feel free to leave me any comments you have below as I always enjoy hearing what others think! 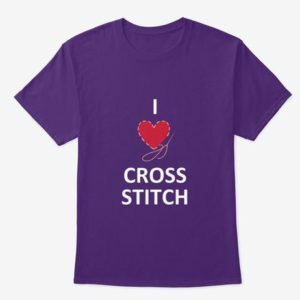 I enjoyed reading this post as I like to run myself and I love to do crosstiching. Send my best wishes to Mel. Loved seeing her and her husbands transformation thanks to running and changing their eating habits. Very inspiring! Looking forward to be member of your cross stitch group, Fae! Pernilla, how exciting to meet another runner/stitcher! Fred and I rather enjoy reflecting on the transformation as well. Happy running!